Pam Duggan of Northgate Farm runs our riding program at the Barn. Campers (ages 5 and up) have the choice of selecting riding lessons up to 2 times a week and riding is open to all levels from complete beginners to polished show riders. No prior riding experience is required. 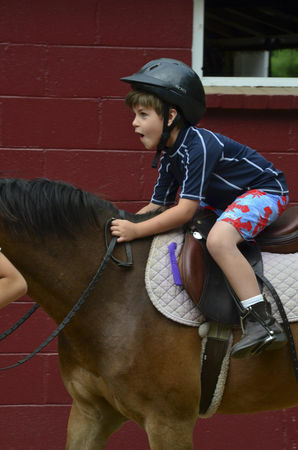 Campers are taught English style riding with an emphasis on the Hunt Seat and Jumper discipline. They are grouped by their level of riding experience to provide for proper instruction. Campers with prior riding experience receive more advanced instruction to ensure they are challenged in all aspects of their riding education. Classes are small and each child will work with their own horse with an assistant by their side. There is an additional cost of $45/lesson for this activity. Long pants and shoes with a heel are required attire for riding. A helmet will be provided. 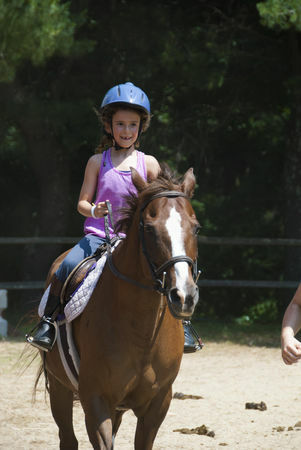 Riding lessons are scheduled during camp activities, so a camp activity will be missed for the riding lesson. However, riding will not take place during swimming. Because space is limited and demand high, if you wish to have a place reserved, return the riding application (available to enrolled campers in your online CampMinder Forms) to Pam at the address below by April 30th. Upon receipt of your application Pam will contact you and bill you directly.